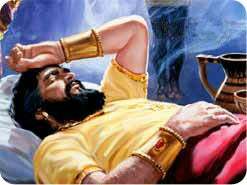 The vast kingdom of Babylon was opulent and prosperous, yet Nebuchadnezzar the king stirred in his royal bed. How long would this golden era last, he wondered, and what would become of his powerful empire when he was gone? With these disturbing questions in mind, the mighty monarch drifted off to sleep. That night, a vivid image of a towering multi-mineral man flashed into his mind with a panorama of color unlike anything he had ever experienced. Throwing aside his embroidered covers, the king jumped out of bed and shouted to his bodyguards: "Call all the magicians and astrologers to come at once. I must know the meaning of this dream!" The king's wise men were roused and herded into the presence of the bewildered sovereign. "And the king said unto them, I have dreamed a dream, and my spirit was troubled to know the dream." Daniel 2:3. One of the phony prophets smugly responded, "Tell your servants the dream, and we will give the interpretation." But as often happens with dreams, the details had already grown cloudy in Nebuchadnezzar's mind. 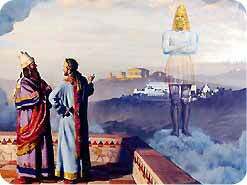 These men had claimed divine insight, but the king was beginning to doubt their abilities. This would be the perfect test. "Tell me the dream and the interpretation, and you will be rewarded," the king told his counselors, "otherwise I will cut you in pieces and turn your homes into dumps!" The magicians and astrologers had no choice but to admit that they were powerless to explain the king's dream without first hearing it. 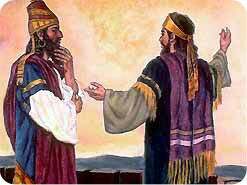 Furious with these imposters, the king commanded that all the wise men of Babylon be gathered for execution. However, the Lord still had one person in Babylon who could explain the dream of the colossal Millennial Man. In this dream of the multi-mineral image, God outlined for all future millenniums the rise and fall of the empires that would have a direct influence on His people. The astrologers and magicians of Babylon claimed to have supernatural power, but when they could not reveal the dream to the king, they were shown to be impotent imposters. If the king had recalled the dream, they would have simply manufactured a bogus interpretation. 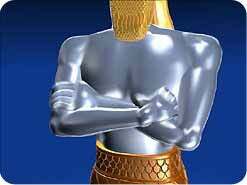 In his rage, Nebuchadnezzar commanded all the wise men to be slain-even those who were not present. Among those absent from the first meeting with the king was a God-fearing captive named Daniel, who had just been trained for the king's service. Daniel 2:16 . Daniel went in, and desired of the king that he would give him __________, and that he would shew the king the interpretation. Daniel 2:17, 18 Then Daniel went to his house, and made the thing known to Hananiah, Mishael, and Azariah, his companions: That they would desire mercies of the God of heaven concerning this secret. 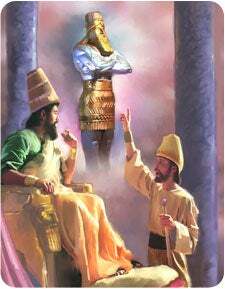 Daniel requested a little time from Nebuchadnezzar and promised that he would reveal the dream and its meaning. 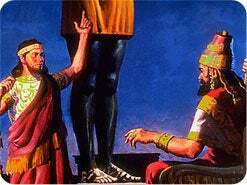 The king, who was still desperate to know the significance of his vision, granted Daniel's request. Then he and his friends appealed to the only Source who could reveal the king's dream. They prayed to the God of heaven. The rise and fall of empires may appear as if happening by the will of men, but Daniel's prayer of praise clearly reveals the essence of divine intervention. Nothing happens that God is not already aware of and has not allowed. Sometimes we may not understand what is happening in our world today or why, but it is comforting to know that God is still sovereign. Only Daniel could reveal the dream to the king, yet he clearly gives the credit to the One who revealed the dream to him, the God of heaven. Daniel 2:31. Thou, O king, sawest, and behold, a great __________. Daniel 2:34. Thou sawest ... that a stone was cut out without hands. The king was regarded as the head of the state. 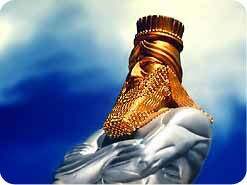 This is why Nebuchadnezzar represented Babylon, the empire that began the prophecy. 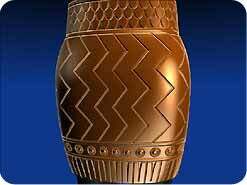 Neo-Babylon ruled the world from 612-539 B.C. as one of the mightiest empires of antiquity, one that could aptly be described as the head of gold. Notice that the prophecy begins with Daniel's time. Babylon's supremacy would not last forever. Succeeding kingdoms, inferior to Babylon, would rule in their turn. Just as silver is inferior to gold, so the kingdom that followed Babylon enjoyed diminished glory. Led by Cyrus in 539 B.C., the Medo-Persian empire conquered Babylon and reduced it to ruins. 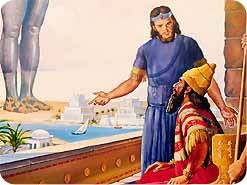 The Medes and Persians were the ruling world power from 539-331 B.C. During their reign, all taxes had to be paid in silver. The brass kingdom of Greece came into power when Alexander the Great conquered the Medes and Persians at the battle of Arbela in 331 B.C., and Greece remained in power until about 168 B.C. Greek soldiers were called "brazen coated" because their armor was all bronze. Notice how each succeeding mineral depicted in the image is less valuable, yet more enduring than the one before it. The iron monarchy of Rome conquered the Greeks in 168 B.C. 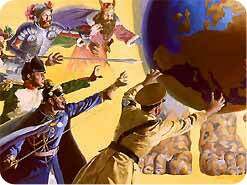 and enjoyed world supremacy until Rome was captured by the Ostrogoths in A.D. 476. Rome is the kingdom that dominated the world when Jesus Christ was born. Notice how Daniel foretold a thousand years of world history with unerring accuracy. The rise and fall of these four world empires: Babylon, Medo-Persia, Greece, and Rome-are clearly foretold in the Bible and proved by the history books. When the Roman Empire began to crumble in A.D. 476, it was not overtaken by another world power. Instead, barbarian tribes conquered the Roman Empire and divided itjust as Daniel prophesied. Ten of these tribes evolved into modern Europe. They were the Ostrogoths, Visigoths, Franks, Vandals, Alemannians, Sueves, Anglo-Saxons, Heruls, Lombards, and Burgundians. Seven of them still exist today in Europe. For example, the Anglo-Saxons became the English, the Franks became the French, the Alemannians became the Germans, and the Lombards became the Italians. Through marriage, alliances, and treaties, men have vainly attempted to reunite the European continent. All throughout history, leaders such as Charlemagne, Napoleon, Kaiser Wilhelm, Mussolini, and Hitler have fought to build a new European empire but these words of Scripture have stopped every single would-be world ruler. Revelation 13 tells us there will be another attempt to establish a universal religion, but Daniel's prophecy clearly states that the world will remain politically divided for the rest of Earth's history. The next great universal kingdom will be the kingdom of heaven, which is described in Matthew 25:31-34. The stone that was cut without human hands represents God's kingdom. It will not be a conglomeration of earthly kingdoms, but a total replacement Revelation 21:1. 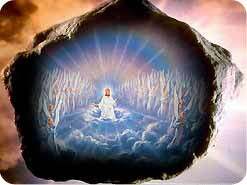 The Scriptures declare that when Jesus Christ returns to earth, He will completely consume all the kingdoms of earth and establish an everlasting kingdom Daniel 2:44. What exciting news! Jesus Christ is coming again! All history is moving toward this climactic conclusion, when the Son of God shall return in majesty to bring in the kingdom of everlasting righteousness. 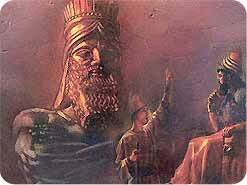 Having seen that God has complete control of world events, even Nebuchadnezzar readily acknowledged that the God Daniel served was above all the heathen gods of Babylon. How quickly the picture had changed! 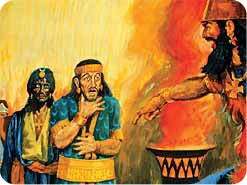 Daniel and his friends, because of their faithfulness to God, were elevated from their initial captivity in Babylon to positions of prominent leadership for the kingdom Daniel 2:48, 49. God always honors those who honor Him 1 Samuel 2:30. Can we take the book of Revelation literally? What role will the US play in Bible prophecy?